Nobody is everything of anything except themselves. That is just my short way of saying that people aren't truly everything they may label themselves as. There are always exceptions. I feel like I don't need to provide any examples. What is any label that you give yourself? "Stupidity" does not mean not creative. Intelligence-challenged (read: "dumb") individuals have the ability to uniquely think outside the box. They may be less knowledgeable about current paradigms (also read "facts") or they may not be limited by current paradigms at all. This leads to a different set of experiences for the individual to draw conclusions upon. I bring this up [finally] because I like to think of all possible solutions and know how people think (Developers/Designs: Great for creating use-cases). Also, I believe creativity is very important in life. It helps us come up with solution to problems we've never seen before. I have at least six other posts on creativity at the time of this writing. My summary of the first point is, "the future is possible", "don't discount the future", or perhaps "". My summary of the second point is, "Don't give up until you try. Then try harder." My summary of the third point is, "technology is magic." Interesting: "One of the biggest roles of science fiction is to prepare people to accept the future without pain and to encourage a flexibility of mind. Politicians should read science fiction, not westerns and detective stories." Sounds Good: "I have great faith in optimism as a guiding principle, if only because it offers us the opportunity of creating a self-fulfilling prophecy." Today, I spent time installing both MoSync and Titanium. Then, I tried to create a basic "Hello, World!" program with them. These results have a clear winner. I am running the free version of both programs on Windows 7 (64-bit). I only tested developing Android applications at this juncture. iOS development requires a Mac for both of them (also according to Apple licences: "can only compile and publish from an Apple device"). MoSync's first impression is fantastic for developers. Users are able to see results very quickly. Keep in mind, this was only a test in first impressions so far. Very important, but nevertheless, I will still be experimenting with both MoSync and Titanium as the summer goes on and be posting about my experiences. This summer I'll be experimenting with different cross-platform tools in order to be more efficient with my time. The development tools that I'm mainly looking at will create native code code for each platform that the app runs on. The biggest reason for this is performance and having a native UI that users are used to with their platform. So, the collection that follows are my notes I took when researching many of different cross-platform tools. In doing background research for the cross-platform tools, they are great for basic app creation. But, app can quickly become non-basic as soon as they start accessing native APIs that are only available for a specific platform. Some of the biggest pain points with the cross-platform tools may be integrating other open-source codes, using multi-touch, gestures, and native UI features/paradigms. But, there are cross-platform mobile development tools that help with those features. A big note on using cross-platform tools to create native apps: It is not "write once, run anywhere" (WORA). The idea of creating these native apps is to maximize code reuse and/or provide a higher abstraction level for development. Up to 50-95% of the code you write can be reused depending on the type of app you are creating. These final choices I made are bias because I didn't want to spend over $1000 for Unity3D. I don't even want to spend $200 for MonoDroid/MonoTouch, but I will if I don't care for the free options as follows. I chose these options mainly because of their documentation, sample APIs, developer communities, and active development. Both of the following are free up to a certain point, but because I am in academia I get to go a little further with the tools. 1. MonoDroid/MonoTouch: ($99 academic rate per developer, per platform) The regular Mono library is free, but it is just an open source implementation of the .NET framework. It does not include tools for integrating with iOS or Android. Both of these tools integrate Mono into them. Conclusion: Good if already have much code in C#, or prefer the .NET framework. - MoSync (native app, HTML/JS w/optional C/C++ extensions) (open source | Free): Seems promising. Needs Mac for iOS publishing. - PhoneGap (web app, HTML/JS): Very limited, though has basic access to camera, contacts, some sensors. Wikipedia also has a very long list of potential cross-platform tools to choose from. It may be helpful if you are trying to do more background research into the many different types of development tools that provide non-native code when compiling for different platforms. Source: I originally put this on my developer blog. "I've Been Around the Sun 24 Times"
For some reason, putting age in this form makes it seem like such a smaller number than saying 24 years old. Saying, "24 years young" seems to me to be more trying to convince others that one is young through verbal manipulation. It's a good smile. Anyways, just extending on more ways to show passage of time.. I am just two Jupiter-years young. I'm almost one Saturn-year old. I'm 24 years of age. I'm as old as a 24-year-old tree. ps - There is no particular reason that I'm talking about age except that my weekly news feed includes a collection of trending Quora posts and I go to thinking. I've been asked many times, "what size logos do I need to upload to Google Play's Developer Console?" and "how many screenshots do I need to take?" So, here's a post that I point people to that explains everything you need to know about uploading graphics to the developer console in order to have an app published. A very important point to remember: These images that are uploaded are one of the main factors potential users use to determine if they want to download it or not. They may not even read the description if you have an ugly app logo. Invest wisely in a great logo (either time or money). Google Play also allows each app to have one YouTube video associated with it and appear in the description. This is a highly effective way of showing that your potential users want to use your app. The first part of this post will give a walkthrough on how to upload the required graphics to the developer console and the second part will have more resources for designers. Go to https://play.google.com/apps/publish/ and select the app that you want to add the graphic assets to. You may either have to click "All Applications" in the top left or "Publish an Android App on Google Play" if this is the first app you are creating (create a title and click "prepare store listing"). You should now be in the "Store Listing" section for your app of choice. Scroll down until you see "Graphic Assets." The screenshots section should be the first graphic assets to add. Now, you can either drag the screenshots onto the "Add Screenshot" box or click the box and browse to where the image is located. 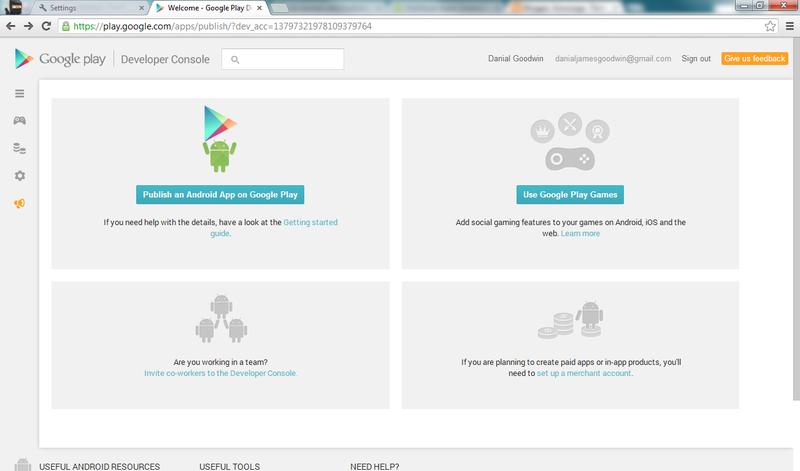 A minimum of two screenshots are required before the app can be uploaded to Google Play. Scroll down a little more until you see "High-res icon". This is the final required graphic asset that must be added before publishing. It should be 512x512px. See 4. Summary below to see more details. 2. Resources - Things change, so here's a link to the official Google Play Design Guide that all developers, designers, and Android app publishers should read. Android Icon Design Guidelines. Here's some tips for designers to work more easily with developers. Designers, please follow these guidelines when creating assets for Android. It will just make things so much easier for developers. The biggest thing is to not have any spaces or capital letters in the file name. All About Launcher Icons. Launcher icons are the icons that users see when they install the app; It is what they must click on to open the app. You don't want your icon to be so bland that the user can't easily distinguish it from the many other apps they have already downloaded. Google Play allows you to create localized versions of your graphics. Think about translating any descriptions and titles on your graphics to the other languages you support. And always, do market research (or due diligence) to make sure that you aren't trying to upload the same style icon/logo as another app. Your app will seem like the spammy one. You want to have a distinguished style to set yourself apart from others (but not too different). Check out the Android Iconography. That link above will walk you through the steps necessary to be able to upload apps on Google Play and start making money from them. The options are self-explanatory. But, the first thing that you would probably want to do is set up a merchant account in the bottom-right. This is how you will be able to accept in-app purchases and create paid apps. The second step for you probably (if you aren't a developer) is to invite co-workers to the developer console in the bottom-left. This will allow you to invite by email your developer to upload the Android APK (app packages that users download and install on their device). You can also invite your graphics designer so that they may upload all of the required logos and screenshots. And either yourself or a copywriter can fill in the app description and promo description. I will eventually create more posts that explain exactly how to perform each of the roles for the developer, designer, and copywriter. I know how to do each of these because of the many Android apps that I've successfully published. If you are also doing each aspect of the app publishing, then I highly recommend reading http://developer.android.com/design. There is a lot of highly useful information there. But, don't limit yourself to just that one great resource. It takes a lot of knowledge to have a highly successful app. Cool idea executed well in Sydney. Warning stop signs don't stop drivers, so something more physical and in-your-way stop sign is being used. Have you all heard about the scientific 7 minute workout yet? What got me thinking was, how do we add more spinal support for humans in cars and car crashes? And, what if humans needed more spine support for different activities? Using non-newtonian fluids (or some other fluid) as the basis for a spinal cord support, if the person is moving slowly, then they are allowed to flex and flexible. But, when they encounter a sudden change, the support will become rigid-like. I'm probably missing some facts (or a whole premise may be missing), so some more original research is required. I wrote a new post in my developers blog (Danial Goodwin), but it may also be useful for readers here because it doesn't really have to deal with code or IDEs. The first part of the post talks about Google IO's keynote and has the prediction: "By this time next year, Google will announce that Android OS will be fully integrated into Chrome. Just like Google Glass extends Android experience on the phone. Chrome on computers will be able to extend the Android experience." In the second part, I drone on in one large paragraph about "content creation as just a phase in our human social lives". Also, I mention content absorption, being a data-centric world, and eventually having nothing else to learn. There are many great episodes that come to mind specifically when I think about The Twilight Zone or The Other Limits. Each one of them expand your thinking to new dimensions or allows you to see something in a new light. It took quite a searches to find one episode in particular regarding religion. I tried to search queries such as, "the twilight zone new jesus", "the outer limits (tv show) religion", and many more searches that progressively got longer until something like "(tv show OR movie OR video) guy preaches, bible in his hand gets shot, he dies and he replaces jesus". Those long queries didn't even help so I had to start looking through each of The Twilight Zone and The Outer Limit shows' summaries one by one until I found the show that I was looking for. The main episode I was interested shows a sample of what blind religion is and could be: The Outer Limit's "Revival" episode. Whilst looking for that episode I found another interesting one that I kept running into when looking for the above show. It's about finding the DNA of Jesus and using in vitro fertilization to bring about the second coming of Jesus: The Outer Limit's "The Shroud" episode. I could explain the full videos in just a few paragraphs in order for the reader to save more time, but I wouldn't want to take away from how awesome the series of The Outer Limits and The Twilight Zone are. Even though I talk about and link to two of The Outer Limits shows, in my opinion The Twilight Zone is better overall. The later expands one thinking in even more directions. Straight to the point some quick fun. First are the directions to get your band name from Wikipedia, then I will tell my results. 1. Click here for a random Wikipedia entry. This will be the name of your band. 2. Go to Random Quotations. The last 4 or 5 words of the very last quote on the page is the title of your first album. 3. Click here to go to Flickr’s “Explore the Last Seven Days” page. The third picture, no matter what, will be your album cover. 4. Now add them all together. 2. "Raised Writing to a New Low"
4. So, look out for my newest release, "Raised Writing to a New Low" by Unusual Heat! When Will Electronics Not Need Electricity? Electricity is a hamper to our society. You may argue that we would not be where we are today without electricity, and you'd be absolutely right. But, the problem is that many great products we enjoy require electricity; the electronic products we use today NEED electricity to operate. Electricity is just a median for the electronics that we want to use. We don't actually care about electricity, we care about being able to operate our computers, televisions, phones, lights, and toasters. Just like computers used to be people who were good with computing numbers in their head or on paper, electronics of the future will not be using electricity as a power source. Don't be stuck in a paradigm. Facts change. First, the overall premise for creativity is divergent, then convergent thinking; First, one must expand their thinking, then follow up with narrowing down the many different ideas/tangents to something to act upon. Method A - Use the Bad Idea Theory. Another person calls it the McDonald's Theory. Basically, when nobody has any ideas, one should suggest a really bad idea. After that, ideas will magically be thought of by others. Others in the brainstorming group will know that whatever they say can't possibly be any worse than what was first said. Method 1 - Think individually, collectively. This method involves paper and pencil. Everybody starts off with a blank sheet of paper. The idea is for everybody in the group to write down at least three "random" things related to the topic at hand, then pass the paper to the left. Then, the next person should expand on whatever is written down on the paper. Continue passing all the papers around until all have written on it, then continue talking about each of the papers as a group. This method has the benefits of thinking solo and thinking as a group. Though, it may take a little longer, good ideas are worth it. Method a - Round robin. Or whiteboard. Typical case, there should be a "leader" of the pack which specifically asks each person what they are thinking so that everybody contributes. Each person has had different experiences in their life. This is the most common because it is the easiest. What are some other group brainstorming ideas? ps - No examples given, because thinking is good for your health. I'm currently reading April's edition of CE Pro and have found some good tips in it already, on page 8. "Assuming that tailgate peddling is legal, it's a genius idea: If the customers aren't coming to you, go to them." It explains how a person went to sell wireless speakers (and other products) at tailgate parties. And a credit card reader was carried around. Of course, you may already know about door-to-door salespeople. But, it's time to expand on that idea. An easier way to get sales is to sell products at the moment people are having their pains, not as an after-the-fact sale.